The Shepherd’s Center of Kernersville was founded on the dedication and commitment of volunteers who provide vital support to adults in this community who are aging or with disabilities. This service award pin recognizes exceptional service which benefits our community. Any volunteer demonstrating this extraordinary giving spirit may be nominated by a service recipient, another volunteer, board member, staff person, or anyone observing this exceptional service. Nominations should be submitted by March 1 or September 1 of the calendar year. Our volunteers are the backbone of this special organization. Without their dedication and hours of service many of the area older adults or persons with disabilities would not be able to make it to their medical appointments, talk with another individual for days at a time, receive respite care from the challenges of caring for a loved one day after day, have a Senior Enrichment Center where they can make new friends or participate in learning and activities, communicate with family and friends via email and Facebook, borrow medical equipment, have someone to assist with minor home repairs, have friendly visitors to come by, receive counseling, or participate in support groups. Our volunteers make this happen! The Sonny Simpson Service Award was established to recognize the volunteers who go “over and beyond” what is expected. Sonny Simpson was one of our early volunteers who became our Handyperson Volunteer Coordinator. He was a shining example of servant leadership; therefore, when this award was established it was named after his dedication. 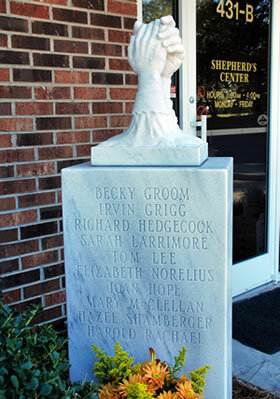 Periodically volunteers are selected to have their name placed on the Sonny Simpson Service Award statue which is located by The Shepherd’s Center’s front door.